Perhaps you think it has been a month since my last post because I haven't been knitting. I have been knitting. Knitting less, like the last post resolved, but I have been knitting. 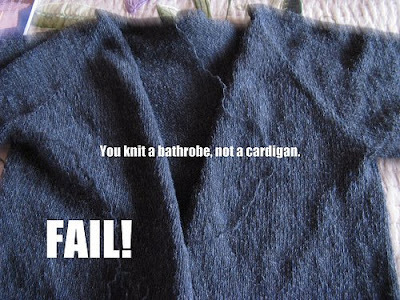 It's just that I've been knitting a steaming pile of FAIL lately. I have never had so many failed projects and UFOs, ever. 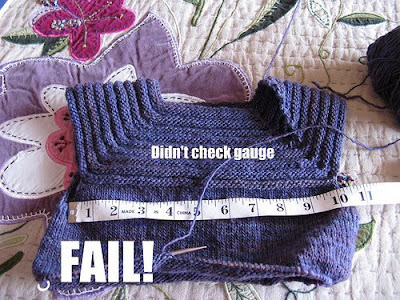 It seems that in my new, knitting-less-life, I am less inclined to troubleshoot, and more inclined to just abandon a problem-project. It also appears that I am less willing to expend mental energy planning projects, pairing yarns and patterns, or working my way through to an FO. This is the longest-lingering FAIL, from back in November. This sweater was intended as a holiday sweater for Pepe. I tried a top-down set-in sleeve and picked up too many stitches. This is eminently salvageable, as I can simply pick up fewer stitches around the armhole. However, the holidays have passed, sweater season is quickly coming to an end (she says hopefully) and my boy is likely to be too big for this garment by next winter. Possible Solution: Frog and re-knit in the fall as a top-down raglan. This Little Sister Dress was intended for a baby girl born recently to a good friend. I intended it to be about a one-year-ish size, for something for Baby Sammi to grow into and wear next winter. Due to never even attempting to get gauge, it fits my daughter, who turns 8 next week. Possible Solution: Rosebud gets a vest. Baby Sammi gets something from Baby Gap. It's really discouraging to have two baby projects that fail, since baby knitting is supposed to be such instant gratification. But, here's another, for an as-yet to be born baby. The parents do not yet know the gender of the baby. In this case, I usually knit something red, but these parents have a high probability of having a redheaded child, so I went with an easy-care green cotton (Araucania Pomaire). 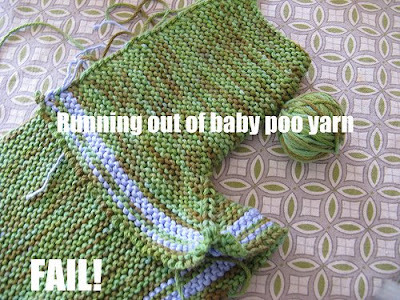 I ran out of yarn. I knew I was running out of yarn, so I began striping in another yarn, and promptly ran out of that yarn too. Then my mother kindly pointed out that the nice green colorway looks like a lot like baby poo. Only Possible Solution: Frog. Start over with new yarn that does not look like baby poo, like Dream in Color Happy Forest. I have this swingy, open slouchy cardi. It's from Michael Stars, so its more of a cotton t-shirt knit than a sweater, but I LOVE THIS THING. I wear it all the time. (I also didn't pay what the website says, so stop hyperventilating that I spent $70 on a t-shirt. In this economy, if you pay retail in Bloomingdales, you are just not trying.) So I thought I'd knit one. I used the Slouchy Cardigan from Greetings from the Knit Cafe as an inspiration, and made a top-down raglan from a lovely charcoal Silky Tweed. Now that it is mostly done, I just don't like it. First, the sleeves are way too wide. They'll have to be reknit. But also, I'm not getting the neckline right, despite a couple of attempts. It feels less like a swingy, drapey cardi, and more like a cropped Jedi Master Robe. Possible solutions: Try another neckline treatment again. Reknit sleeves. 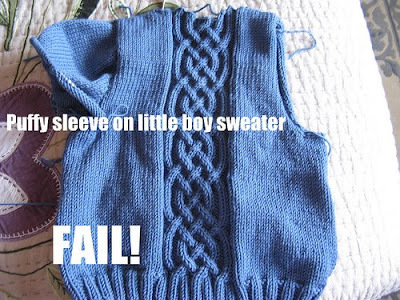 Or frog and knit a Minimalist Cardigan. Or something else. It hasn't been all FAIL, though. I did knit one successful project, one which I'll share as soon as I block it and sew on the buttons. And I learned something really important from this project. 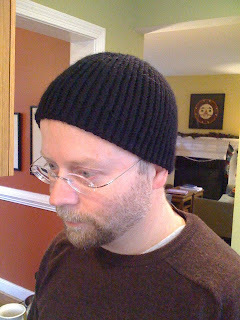 I learned that I need a new paradigm for my new knit-less life. I need to scale back my ambitions to reflect my mental energy, and stick more to tried and true patterns rather than try to design something, even something as simple as a top-down raglan. I need to consider project monogamy vs. multiple WIPs. I need to focus a bit more in the planning stages. 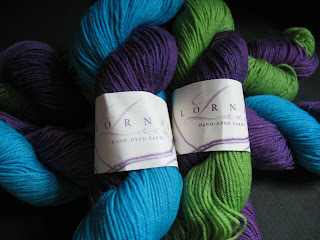 I probably need to stash less yarn, and purchase yarn project by project more often. This might result in more success and less FAIL. As I rush to tie up loose ends (literally), tend to a sick child, and pack for a trip to Vermont, I came across this Panopticon post relating to the process of knitting. Franklin captures my experience perfectly. I'll be posting again after our trip to the North! I regularly count my blessings these days. Every week I hear of another neighbor, friend, or relative who has been furloughed or laid off. My husband's employment seems secure so far (can you hear me knocking on wood?) but we're not taking any chances. Meals are simple and at home, movies are Netflix, and trips are more local and to see family. I don't feel deprived because I'm not. I live a solidly upper middle-class life, send my children to a private school, and have the luxury to be a stay-at-home mom. However, my habits have changed. I have been knitting primarily from the stash for almost a year now and with the exception of a few special projects, this will remain my modus operandi. My plan for 2009 was to be more mindful of my projects in an attempt to find balance; now I see that this mindfulness, intention, and restraint has the additional reward of being financially responsible. Don't get me wrong, I still knit boutique yarns - the experience is so pleasurable and I do want to support small-scale producers - but I no longer have room for impulse purchases. Today I have a few projects in the works: some socks for my eldest daughter and finishing a border on a "Blessingway Blanket" (more details on this soon!). Both are projects that are inexpensive and are quite fun.